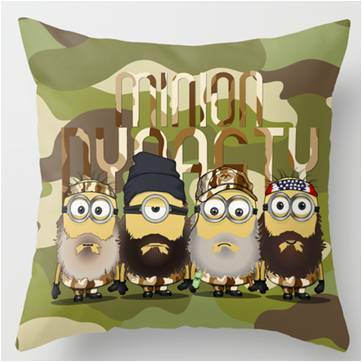 What do you get when you cross Duck Dynasty with Despicable Me Minions on a throw pillow? This 16-inch by 16-inch funny Despicable Me Minion throw pillow COVER features four favorite Minions dressed as the Robertson men — brothers Phil and Si, and Phil’s sons Jase and Willie, from the reality TV series on the Arts and Entertainment network. The series is about a family-operated business in Monroe, Louisiana who have made a fortune making products for duck hunters. The main characters, known for their long beards have been hilariously represented on Minions Stuart, Dave, Kevin and Tim. This camo, artist-designed pillow has images on both sides in shades of green, tan and brown with gray, red, white and blue accents. It comes with a washable poplin cover and concealed zipper for easy removal when cleaning. The pillow is also available in 18×18 inch and 20×20 inch sizes as well as WITH and WITHOUT the pillow insert. It can also be purchase with INDOOR and OUTDOOR fabric options. Consider a larger size pillow or pillow cover (to wrap an existing pillow) as an option to snuggle in for a nap, use as a perfect floor pillow for watching TV or playing video games or have double as a reading pillow. This two-sided, artisan designed 16-inch by 16-inch, camo colored Despicable Me Minion throw pillow and is a zippered, removable PILLOW COVER ONLY. It is available to order WITH an insert. It features a goggled one and two-eyed Despicable Me minions Stuart, Tim, Dave and Kevin, fully outfitted to resemble the main characters in the Duck Dynasty reality TV series on the Arts and Entertainment network. The Minion camo pillow cover is made from 100 percent spun polyester poplin making it very durable yet removable for cleaning — it features a convenient, concealed heavy duty nylon zipper. This 16-inch by 16-inch Despicable Me bedding option is also available in 18-inch by 18-inch and 20-inch by 20-inch sizes. It can be purchased as a PILLOW COVER for an existing pillow and can be purchased with INDOOR or OUTDOOR spun polyester fabric.